CBS News reporter Charles Wolfson is a former Tel Aviv bureau chief for CBS News who now covers the State Department. Last year the Department of State processed 12.1 million passport applications. This year it expects to handle 18 million, according to department officials. That's a quantum leap in paperwork which any bureaucratic system would be hard pressed to deal with to everyone's satisfaction. Federal officials anticipated a big increase in numbers due to congressionally-mandated rules requiring Americans who travel by air to show a valid U.S. passport when returning from Canada, Mexico and the Caribbean. The law went into effect on Jan. 23. The department set up call centers and hired hundreds of additional workers to handle what State Department spokesman Tom Casey called a "tremendous surge" in passport applications. But it became clear to State and Homeland Security Department officials the system could not handle the paperwork in the 10-12 weeks it promised. One significant obstacle was with the financial center that was subcontracted to handle the fees which Americans pay with their application. A 24-hour turnaround time was promised and the time actually went to four weeks or more in some cases, officials say. The growing problem was not a secret. Members of Congress heard from their constituents and there has been an increasingly urgent demand that something be done to ease the situation. Consultations involving not only the State Department and DHS but also the Commerce Department, the White House and Congress resulted in a temporary easing of the restrictions. 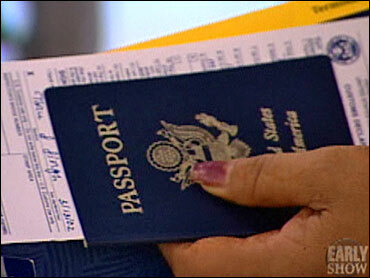 Until the end of September, travelers will have to have one valid, government issued ID, but they will also have to show a receipt indicating they have applied for a passport. Not surprisingly, there were differences of opinion on how to handle the problem. One State department official said "I wouldn't describe DHS as overwhelmed with joy" that we had to ask for an easing of the passport requirement. And he added "We didn't need Congress to tell us there was a problem because we were getting calls from concerned, scared or just plain pissed off Americans" complaining they were not getting their passports as promised. Of course State department officials did hear from Congress and the various agencies involved finally reached a solution which officials hope and expect to get them through the current problem, allowing Americans to keep their work and travel plans this summer. "We recognized the problem, we promised a solution," the senior State Department official said, hoping the worst was over. "The demand overwhelmed the system. Things didn't go as planned." Thousands of Americans standing in lines in passport offices around the country can probably be heard muttering "no kidding."